​They also considered eight unfavourable effects, but only three showed any clinically relevant differences among the six drugs. The first two are serious or non-serious gastrointestinal effects (each taking account of incidence rate and severity), and the third is potential for toxic overdose (either accidental or deliberate). The numbers are scores out of 100, which represent the overall added clinical value of each drug. They take into account available data for the effects and judgements by the experts about the clinical relevance of the effects. Bar graphs after the 62-38 weight is applied show the separate contribution of benefits and safety to the total. The upper light teal segments represent benefits of the favourable effects and lower dark teal segments show safety of the unfavourable effects. A scatter plot of effects before weighting between benefits and safety shows ibuprofen is best for benefits and safest, with aspirin lowest in both benefits and safety. PROS Best for pain relief and speed of onset. Only naproxen’s duration is longer. Both forms of ibuprofen are lowest for overdose potential. CONS Poor for serious gastro-intestinal effects. PROS Duration of action is best and pain relief is second best. Speed of onset is good. CONS Only better than aspirin for serious GI effects and worst for possible kidney damage. 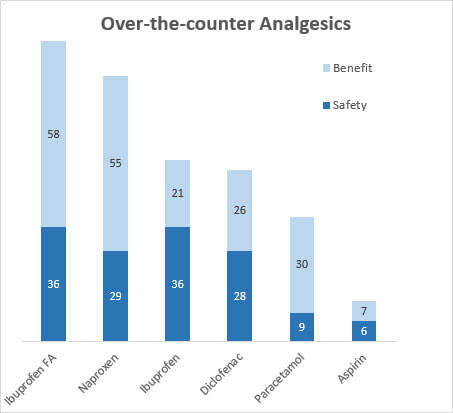 PROS Pain relief is better than diclofenac, paracetamol, and aspirin. Share lowest potential for overdose with soluble form. CONS Worst for speed of onset. PROS Better than paracetamol and aspirin for pain relief. CONS Least preferred for serious cardio-vascular effects. PROS Speed of onset good. Pain relief better only than aspirin. Safest drug for serious GI effects but has the highest potential for overdose. PROS Duration of action is somewhat longer than paracetamol or diclofenac. CONS Aspirin's overdose potential is little better than paracetamol. For the favourable effects and for skin reactions, the experts agreed data gleaned from published random controlled trials (RCTs). No RCTs for the remaining unfavourable effects could be found, so the experts discussed available published research and shared their experiences and knowledge in assessing direct preference values. 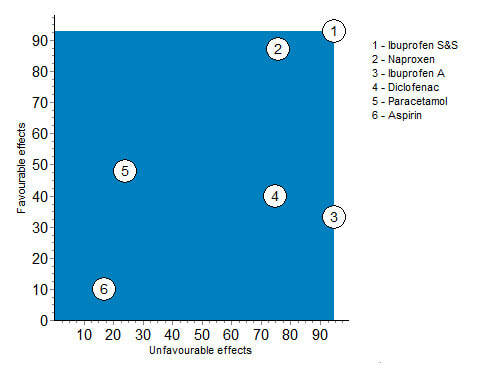 Each row of the unfavourable effects (excepting skin reactions) contains one or more 100s and 0s, representing experts' judgements for the difference between the clinical value of the best and worst drug(s). Values in between express judgements of the relative differences between the other drugs. Note that these numbers are relative, so zero does not mean no value, it represents the drug with least value for that effect. ​Green identifies the best drug for benefits, while red represents the worst drug for safety. Pain relief: Proportion of patients suffering moderate to severe pain who individually report pain intensity reduction by 50% or more.